Dr. Joseph Bedich now welcomes new patients for Invisalign® in the Warren, OH and Youngstown, OH areas, to receive discreet, clear braces, with or without a referral. Dr. Joseph Bedich encourages patients interested in receiving Invisalign® in Warren, OH and surrounding Youngstown, OH areas to visit his practice for treatment, now, with or without a referral. Clear braces are often preferred by adults and children looking to straighten their smiles without metal brackets and wires. Crooked teeth, although commonly considered an aesthetic issue, can also have a negative impact on oral health by making it difficult to reach all surfaces of the teeth when brushing or flossing. Dr. Bedich understands the oral and overall health advantages braces can offer, and encourages patients with crooked teeth to consider Invisalign in Warren, OH. Clear braces are discreet compared to traditional metal braces. Adults and teens who do not want to draw attention to their teeth now have a subtle, comfortable alternative to traditional orthodontics. In addition to their discreet nature, invisible braces are also valued for their comfort. While some braces are known to get caught on the sensitive tissue lining of the cheeks and lips, invisible braces do not have this problem. They are made from clear plastic that is smooth on the surface and does not scratch the oral tissues. They can also be removed quickly and easily, making it possible for the wearer to enjoy his or her favorite foods or take care of dental hygiene needs without working around protruding wires and brackets. Those who wear invisible aligners generally have an easier time maintaining good oral health than those with traditional orthodontic appliances. Invisalign also requires fewer dental visits than traditional braces, making it easier for patients to maintain their busy schedules with minimal interruptions. Dr. Bedich urges patients with crooked teeth to improve their appearance and oral health with Invisalign in Warren, OH. Appointments to receive clear braces can be scheduled by calling The Center for Progressive Dentistry during regular business hours at 330-615-1598 or by visiting http://www.adazzlingsmile.com. Dr. Joseph D. Bedich is a general dentist in Cortland, OH offering personalized dental care to patients. 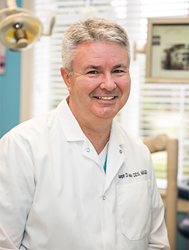 Dr. Bedich understands the importance of learning the most cutting-edge techniques, which is why he has taken over 2,500 hours of continuing education in a wide variety of services including sedation, implant dentistry, sleep apnea, cosmetic dentistry and head and neck pain management. To learn more about Dr. Bedich or the services he offers, visit his website at http://www.adazzlingsmile.com or call his office at 330-615-1598 to schedule an appointment.